In front of me is a picture of Habiba Ahmed Abd Elaziz, an ambitious young woman primed for a bright future. She was known as a serious journalist from an early age and was well versed in Arabic and English. All this came to an abrupt end in Cairo last Wednesday, when Habiba was felled by a deadly bullet at one of the entrances to the Rabaa al-Adawiya protest camp. 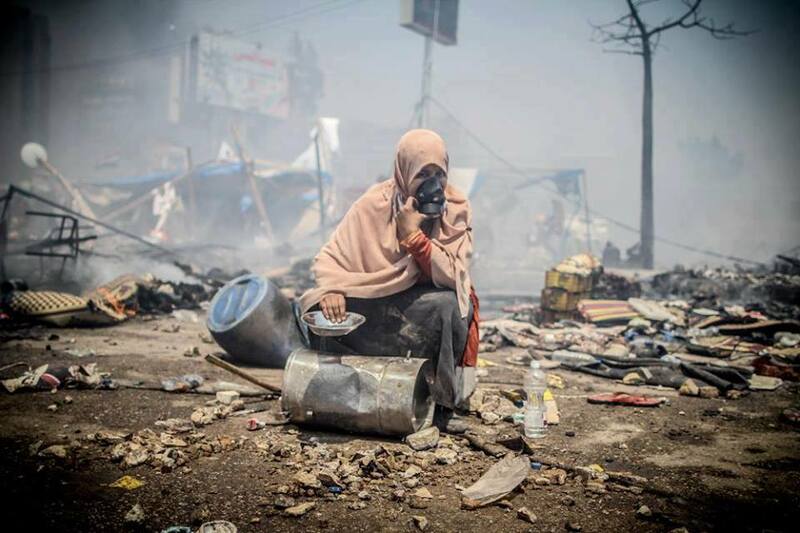 Search the social media for her last poignant picture showing a militant believer sitting resolutely while being surrounded by debris and destruction and engulfed in tear gas. All men had gone their way while she stayed put doing what she was asked to do. In her right hand is a small tin bowl she was using to bank a metal drum. Her ration is a bottle of water. A hijab covering her head is wrapped around her shoulders. The gas mask she held to cover her nose and mouth did not fend off the bullet that took her away in the springtime of life. Who fired the bullet is immaterial. It was most probably an Egyptian policeman or a sniper hiding on a nearby rooftop and rejoicing at killing “the other Egyptians” he hates and perceives as enemies. I wouldn’t go into blaming the army, state security and the police. Like their Arab counterparts, that’s what they have been training to do for decades – namely, to protect the regime and the state. Their mantra is to secure the state at any cost. “The regime, the state, the leader” is what Egyptian media outlets are now trumpeting – much as they were doing on June 6, 1967. No freedom or dignity to freedom’s enemies, not even to a co-citizen, a cousin or schoolmate. But I do blame, and call for holding to account, the Muslim Brotherhood leaders for promoting the illusion of steadfastness at the sit-ins in Nahda Square and Rabaa al-Adawiya as a means of political pressure. They managed the sit-ins lightly and with total disregard for the blood of believers in the cause. Martyrdom is a duty in defense of justice, but not to improve bargaining positions or score political gains. Habiba and thousands of other victims were promised total victory the next day. They say victory is an hour’s patience away. That’s what they were promised. They gave them the instructions: You build a berm; you bring some water and vinegar to treat tear-gas sufferers; you, Habiba, forewarn your brethren by banging this metal drum. And everyone, the 10-year-old included, knew the terrorist would be killed. So what happened in the early hours of Black Wednesday was not surprising. No Brotherhood leader ought to come forward and accuse the army or police of treachery. He was told of their intent to take decisive action. How many times did Brotherhood leaders say, “We should not be drawn into the (army and police’s) violence arena”? But Brotherhood leaders were nevertheless drawn into the arena, where they lost their trump card, namely: demands, competitiveness and politics. The Brotherhood will henceforward be capitalizing on its victims. It will use thousands of casualty images showing men and women in the springtime of life, elders with piety manifest on their faces and veiled women to appear as the scapegoat and win the battle for public opinion. But it will be a losing battle. The gory images will only elicit verbal condemnations and suppressed anger from those who lost loves ones. The January 25 revolution is over. Its most important values – freedom, dignity and the right to life – have fallen by the wayside. The majority cannot bear freedom abuses so long as their own freedom is not stake. The majority is unmoved by the sight of martyrs when they belong to the other side. There is one advantage though in reviewing images of the dead, which is accountability. This has more to do with self-accountability than with holding the army and police accountable. Let someone come forward and enumerate the Brotherhood’s losses since holding the reins in Egypt 18 months ago. It lost sitting at the helm after winning what it described as a divine mandate to move forward society and the nation. It lost a massive segment of Egyptian society. It lost its nationalist orientation and replaced its moderate jurisprudence by a narrow-minded one, which it cajoled for electioneering purposes. It lost martyrs. It lost its revolution allies. And it lost its regional relationships. I can also imagine the young man returning home last Wednesday night. He is exhausted and bloodied. He weeps for his dead brethren. He searches the social media for reassurances his other friends are safe. A knock at the door frightens him. He is a wanted man now. He does not wish to become a fugitive. He forswears violence and is aware the leadership has lost control, or almost. He catches a glimpse on the TV screen of a church going up in flames. On hearing a leader trying to justify the arson, he fumes. Before going to bed after Thursday’s dawn prayers, the young man murmurs to himself: “The revolution is not over yet. Recourse to the people is still mandatory. There will be new and transparent elections. Political Islam and revolutionary forces have to reconnect. A new generation has to take the lead and look to the future, not the past. “But accountability should come first. Those responsible for the failure and successive losses of the battles of governance and sit-ins have to be brought to account.